Yes, I’m about to break the famous fashion rule: “No white after Labor Day.” To me, white is an iconic color that can go all year around, and many of my key fall and winter pieces are white. Today I’m going to share with you one of my current favorite outfits for this season that includes some white pieces that are perfect for after Labor Day! I started this look off with this adorable, distressed white sweater. I loved all the fray on the sweater, and it was super comfy. It’s the perfect item for all the upcoming cold months, and it can be pared with so much! This sweater is the perfect example that white can be worn after Labor Day, because it’s such a cold weather staple/essential! I also pared this look with a tweed blue, black and white distressed skirt. This skirt is the cutest! The pattern is super trendy right now and makes this outfit look super classy, even though it’s still pretty distressed. This skirt can be dressed down or up, and it’s the perfect piece for an in-between look! To tie the whole look together, I added a Blue Pendant Necklace from Lancharmed. The top of the outfit didn’t have a lot of blue in it, so this necklace was the perfect accessory to tie in the colors! It’s also amazing quality for a relatively low price! 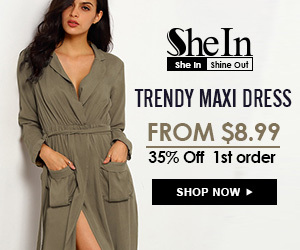 If you’re interested in buying any of the SheIn items, you can pick them up for 20% off with my code “hann20”! That’s all for today’s post! Do you think the “No white after Labor Day rule” can be broken? Let me know below! Also, don’t forget to email subscribe and comment if you enjoyed this post! Bye loves! Disclaimer: This blog post is not sponsored, but does include products sent complimentary to review and affiliate links. All opinions are my own. If you are interested in purchasing any of these products, please consider purchasing through my links, as this does help me to purchase more products to shoot and review for my readers. Enjoyed this post? Make sure to check Hannah out on her other channels: Instagram, Facebook, and Twitter! That sweater is so cute. I’m in love with the distressed look!